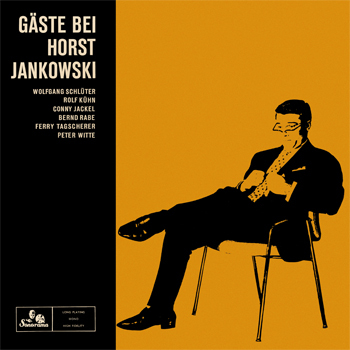 Host of “Treffpunkt Jazz” ("Jazz meeting point") is the 25-year-old Horst Jankowski, who joined the Orchestra of Erwin Lehn in 1955 and settled down in Stuttgart after his years of wandering. He earned himself the reputation as Germany's leading jazz pianist. "Jacob", Jankowski`s nickname among friends and colleagues, especially stunns with his amazing versatility. As a member of a well renowned Big Band, as leader of jazz combos and a large choir, as well as a highly sought after accompanist, he has to fulfill the most diverse tasks and copes remarkably well. He has not only the required highest level of technical skill and musical intuition, but also shows a brilliant talent for improvisation, a striking sense of style and compositional aptitude, which for example is expressed in his "Blue Mood" or "Metro Gnome". Oscar Peterson, who belongs to Jankowski's most respected pianists - next to Teddy Wilson, Hampton Hawes and Russ Freeman - said: "Rarely has a musician been more comitted than Horst". 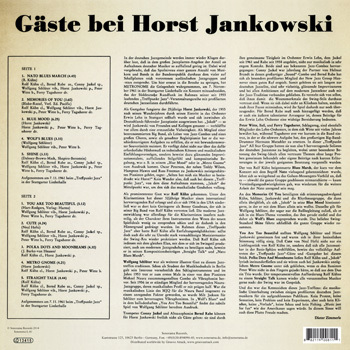 No wonder then, that even at this "Treffpunkt Jazz" from which these recordings hail, Jankowski`s name stands in the center of musical events. Rolf Kühn was invited and attended the session as a prominent guest. Among clarinettists this 32-year-old musician has gained an important international reputation. When he settled in 1956 in the U.S. it was none other than him, who appeared for Benny Goodman in his famous Big band. The modern Jazz development was, however, disadvantageous for the clarinet, as the character of the instrument does not correspond with the nature of the new jazz style and is pushed into the background. As part of this "Treffpunkt Jazz" Rolf Kühn had all opportunities to develop his skills: he also performed the unjustly neglected style of the swing era. That Rolf Kühn seeks, however, to participate in the modern jazz scene with the same vigor, becomes especially obvious with his compositional contributions "Straight Talk" and "NATO Blues March". Wolfgang Schlüter stands out as another illustrious guest. Even as a student at the Academy of Music in Berlin he was interested mainly in percussion instruments. In 1953 he came to the fore as vibraphonist in a combo by pianist Michael Naura. Since 1956 Schlüter is a permanent member of the excellent Naura jazz group whose musical profile he helped to shape. The musical style of the MJQ had become a stimulating factor for the Naura band, with Milt Jackson as Schlüter`s preferred vibraphonist. In "Wolf` s Blues" and the ballad-like" You Are Too Beautiful” the subtle performance of Wolfgang Schlüter finds its eloquent expression. Of course trumpeter Conny Jackel and saxophonist Bernd Rabe are no real guests after all. They are not only musically compatible because of their common activity in the Orchestra Erwin Lehn - Jackel since 1961 and Rabe since 1958 - but they have a lot in common as friends. Both have emerged from famous jazz combos. Conny Jackel was the partner of Helmut Brandt in the great "sound" combo for many years and Bernd Rabe has gained a particularly good reputation as a prolific member of the New Jazz Group Hanover. Thus, they have long been part of the German jazz elite. The musicians are all brilliant improvisers, very versatile and ambitious in the modern jazz sector but also remain connected to the jazz tradition. It goes without saying that they are familiar with the sounds of the swing era. They don`t stick to stereotypes and develop their own style, which makes their performances even more convincing. It still needs to be added that Bernd Rabe is an extremely talented arranger, whose contributions to the Erwin Lehn Orchestra are a tremendous asset. Peter Witte, bass, and Ferry Tagscherer, drums, are also members of the Lehn Orchestra, in which Witte has proven himself over many years, while Tagscherer just recently joined the band in which he has the difficult task of replacing the great big band drummer Hermann Mutschler. In this "Treffpunkt Jazz" All Star band, they had to accompany five excellent soloists of the German jazz scene, with special emphasis on the swing ideal. The Rolf Kühn contribution "Blues March," which was supplemented by the term "NATO" shortly before the concert, is based so largely on the Golson-Messengers style that - although the whole group marches - there were hardly any communication difficulties. Kühn, Schlüter, Jankowski and the rhythm section have been reminiscing about the "Memories Of You", while the rhythm section was left alone when “Jacob” really delved into the blues. The same applies to Wolfgang Schlüter, who even admitted the bass accompaniment only, as he immersed himself in the blues. His theme suddenly occurred to him and was therefore entitled "Wolf` s Blues". Finally the popular swing standard "Shine" was performed by the whole band. reproduction of cover: Patrick Haase, producer for reissue: Ekkehart Fleischhammer.